I love unique. The more unique, the better...especially when it comes to a wedding. Our latest rustic wood and vintage damask invitations are just that. Super unique, elegant and will definitely grab your guests attention. 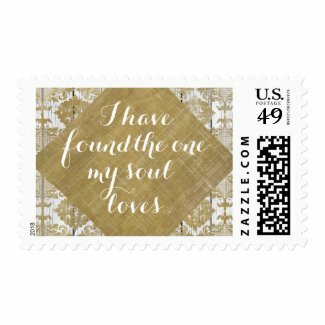 But my favorite new item in this collection is this wedding stamp (pictured above) which features the bible verse, "I have found the one my soul loves" with the rustic wood and lace theme. Great way to top off your wedding invitations, no matter what style of invitation you're using! See the full collection at our store.